Harry was born Ehrich Weisz in Budapest, Hungary in the year 1874. His father was a trained lawyer who moved to Wisconsin due to discrimination against Jews. Here he became a rabbi moving from congregation to congregation to support his wife and six children. At the age of nine, Ehrich was already putting on magic shows in his backyard, When he was twelve he tried his hand at magic by traveling west. He soon moved back to New York to join his father where he worked as a messenger and factory worker while training and developing his body into that of an athlete. He discovered the French magician Robert Houdin and added an I to his name. For a while Ehrich put on magic shows with his younger brother Theo. Ehrich became Harry Houdini. When he met Bess, he teamed up with her magic card act, and they worked to develop new magic show acts. Harry began developing his escape acts beginning with escaping from a steamer trunk and then handcuffs. The tricks became more and more elaborate. After visiting a mental hospital, Harry came up with the idea of escaping from a straitjacket. A man named Martin Beck discovered Harry and booked him for a European tour. At this time he learned the swallowing forty needles trick. All throughout Europe, Harry perfected his handcuff escape and straitjacket tricks and added a new trick which was to escape from a tank filled with water. 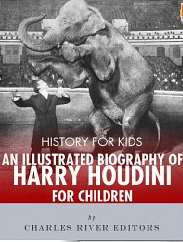 This biography is replete with photographs and posters from the family and mentors as well as pictures of some of the more famous Houdini stunts. Children age seven and older will find his personal struggle, moral character and determination inspiring. The story moves along quickly and is well written. Boys and girls, and of course, magic lovers will find it an interesting read. If you enjoyed reading this post, please subscribe by clicking on the word Follow or hitting the orange RSS feed button in the upper right hand corner.